„Lamento“ has been released on DVD in Germany (missingfilms/indigo). The disc contains the feature film with German or English subtitles, as well as the 2008 short film „Havet“ by Lamento-director Jöns Jönsson. The 23-minute film was produced during his time at the Filmuniversität Babelsberg and premiered in 2009 at the Berlinale. Jöns Jönsson´s LAMENTO joins the 38th Mostra Internacional de Cine in Sao Paulo, in the competition section „Competição Novos Diretores”. The festival takes place end of October. 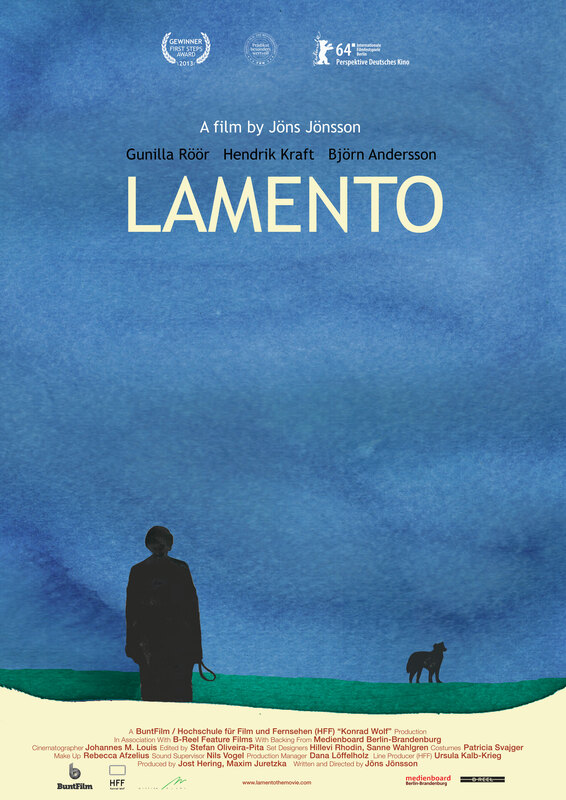 „Lamento“ opens in cinemas in Germany on October 9 , released by distributor MissingFILMs, who have also taken over world sales duties for the film. Magdalena picks up her grand-son from piano lessons, eats dinner with his family, visits the bar. She unsuccessfully tries to sell her daughters dog, she consults a medium. Since Sara´s suicide, Magdalena shields herself from the pain and loss of her daughter, by immersing herself into rituals of everyday life. It is only when Sara´s ex-boyfriend comes to visit, that sorrow finally finds its way through denial, speachlessness and feelings of guilt. Before its official premiere, „Lamento“ was awarded the FIRST STEPS AWARD 2013. The award is given annually to graduates of German film schools and is donated by the German Film Academy, with support from TV-conglomerate ProSiebenSat1.Media AG, Nico Hofmann`s teamworx/UFA, SpiegelTV and Mercedes Benz. Prädikat „Besonders wertvoll“ . The film received the highest rating from German cultural rating board, Film- und Medienbewertung (FBW) Wiesbaden. „Lamento“ is the graduation film of HFF „Konrad Wolf“´ students Jöns Jönsson (director/writer), Dana Löffelholz (production manager) and Nils Vogel (sound). Johannes Louis (DoP) is a student of the master class at the HFF. The rest of the crew comprises of Swedish and German film talents and young film makers. The renowned Swedish actress from film and stage stars as the films ́ lead. Gunilla Röör graduated 1986 from the school of dramatic arts in Stockholm and went on to receive the Swedish film award Guldbagge twice (for 1992 ́s “Freud leaving home” and “Sommaren” in 1995), and was also honoured for her stage acting work. For “The Guardian Angel” (1990) she was nominated for a European Film Award for Best Supporting Actress. Since 2008, she also teaches at the Göteborg university. Jönsson was born in Stockholm. After school, he moved to Italy, before studying cultural studies in Lund. In 2006 he began his studies at film school HFF „Konrad Wolf“ in Potsdam-Babelsberg. He has written and directed numerous plays and short films, most noteably „Havet“ (2009, Best short film at Timishort Film festival; Berlinale 2009) and „Wertingen“ (2011, Festival du Cinema de Brive).